This early drawing by Schiele is a mixed media study in black chalk, gouache, gold bronze paint and white body color on paper. Egon Schiele studied under Gustav Klimt and was influenced by the early expressionism of Van Gogh and Edvard Munch. You can see the world of expressionism colliding in this explosion of colorful blooms. Schiele's signature dark lines and the flattening of space in between the background and tree, speaks of an artist who approached the subject in terms far beyond wanting to portray something decorative. He reveled in the surface of the image, in the exploration of materials and a bold graphic style that was very modern and brute in his day. 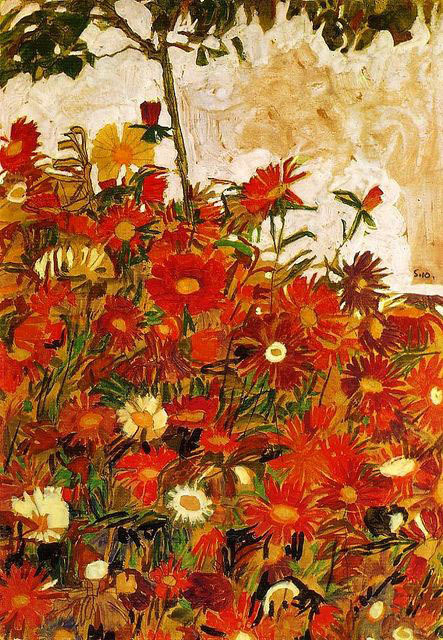 I had only seen Schiele's nudes and distorted figures, but his flowers were an unexpected surprise. He loved creating and whether it was an exuberance of flowers, a forlorn stylized tree or a self-portrait dripping in suffering, he seems to have an honest examination of each and tried to get to the heart of his subject. In his short 28 years Schiele produced over 3000 drawings and painting. He created some of the most impressive examples of drawings of the twentieth century. In his early years his was mentored by Gustav Klimt and participated in group shows until his first solo show in 1914. He's work was emotionally challenging and disturbing sexually to the public. His early years were filled with controversy and ended in a short imprisonment. He later married and had to serve in WW1. During the war he still produced artwork and was even given a spare storeroom to use a studio. 1918 he started to enjoy his first commercial successes with over 50 pieces of work accepted into the Successions 49th exhibition. He died at age 28 from the Spanish flu pandemic, three days after his pregnant wife passed away. Read more about Egon Schiele and view more artwork at the Art Story. Our sponsor this month is Humblebeads. Please visit us tomorrow to see the prizes! Please add the tag or title JAN ABS to your photos. Include a short description, who created the art beads and a link to your blog, if you have one.